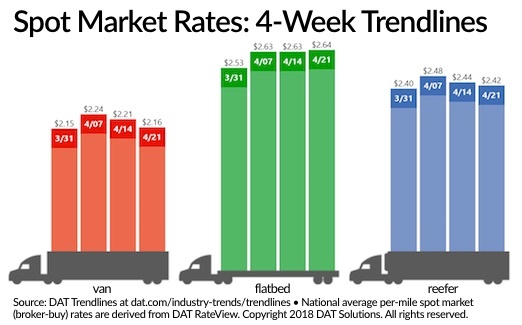 Spot market truckload activity picked up during the week ending April 21, as the number of posted loads increased 3.1% and truck posts rose 4%, according to the freight matching service provider DAT Solutions. The van load-to-truck ratio dipped from 6.6 to 1 to 6.4 to 1, as load posts decreased 1% and truck posts increased 3%. Overall van trends were balanced, with rates moving higher on 47 of DAT’s top 100 van lanes and lower on 48 lanes, with five lanes neutral. The flatbed market remained solid, as load posts increased 7% and truck posts increased 8%. The national average flatbed rate set another record high at $2.64 per mile. The load-to-truck ratio slipped 1% to 102.2 loads per truck to stay above 100 loads per truck for the fourth week in a row. After a 15% drop the previous week, the national load-to-truck ratio for reefers fell 11% from 9.4 to 1 to 8.4 to 1. Reefer load posts slipped 5% while truck posts increased 6%.